This writing comes from a time and culture different from ours, where marriages were arranged by families. This passage addressed the threat that a failed marriage would lead to violent feuding within or among families. When Jews expelled those who believed in Jesus, this letter assured Hebrew Christians that, in Jesus, they have something and someone superior to everything they enjoyed in their ancestral religion. Today the author shows that Jesus, even a suffering Jesus, makes obsolete the mediation of angels, and is a priest superior to the priests of Judaism. As Saint Mark's gospel continues, Jesus continues to inflame his critics with controversial teaching, and continues to correct the misunderstandings of his friends. The Not Just Historical Situation: Can you proclaim this without making it sound cliché? This is a most familiar story; you hear it at every wedding and every time a couple observes their anniversary in a church ceremony. It doesn't seem controversial. But notice how its implications are controversial in today's gospel, Mark 10:2-16. Indeed, if its original ancient audience had taken monogamous, permanent marriage for granted, would the writers of Genesis even bothered to include this? No. Rather, this picture of marriage was and is a revolutionary, challenging ideal. Not convinced? Do the math. Compare the enduring, faithful marriages you know of to the sum of the terminated marriages, non-marital liaisons, out-of-wedlock births and extramarital affairs you know of. You might take the stance of someone trying to prove the rightness of this ideal. Imagine yourself in a debate with a member of the "anything goes" movement, say, a Warner Brothers television writer. You know the story embodies God's plan for marriage; your opponent holds in contempt everything you hold sacred. It's your turn to speak. Let him have it. With both barrels. Don't hold back. Upon reflection, I'd say you should tell it like a story your listeners have never heard before. A story always has a problem. In good stories you cannot foresee the solution. Indeed, in the best stories, one doesn't know if there will be a solution at all. In this story, the problem is strange to us. We don't remember humanity before there were billions of us, most paired up. We've never seen a man with absolutely no potential partners. That's why the Lord's first attempt at a solution is so charming. When you report that the Lord tried to pair this man with "various wild animals and various birds," you should make that sound whimsical. Be more matter-of-fact when you say that the man gave names to them all. Then pause. Pause as if no one knows what's next, as if you want a listener to break the silence and ask, "Well, did he find a suitable partner or not? Come on, tell us!" The plot thickens as the Lord is driven to try a more radical approach. Say the words "deep sleep" dramatically. Think about how bizarre is the image of taking a rib from a sleeping person. And building the rib into another person? Whoa, that's even more strange. Recite these verses with a sense of wonder, as if you hardly believe something so weird was possible or necessary. Now if you've worked on whimsy and wonder, the right intonation of this story's happy ending will take care of itself. So will the triumphant "moral of the story" in the last sentence. But even if you don't try to sound whimsical and wonder-struck, speak the sentences of the passage slowly. For a reminder of how to speak slowly, just think of the last wedding you attended. Rembember how the inexperienced lector, probably a cousin of the bride or groom, recited this passage at the speed of a tobacco auctioneer. Don't even come close to that pace. 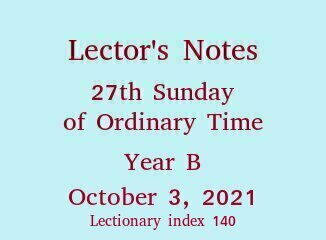 The Historical Situation: From now to the end of the liturgical year, we survey the Letter to the Hebrews. The original audience were Jewish converts to Christ who had to cope with ostracism by their fellow Jews and the loss of the comforts of their traditional religion. The author tries to convince them that their relationship with Christ supplies all the benefits they had enjoyed through the institutions of Judaism. Judaism had no precedent for the idea of a suffering Son of God. God, after all, is exalted above everything. Why did the Son of God have to be subjected to anything? But Judaism did have a precedent for a priest suffering with his people. Here the author of Hebrews supplies some logic for the otherwise scandalous notion of divine suffering. The argument is that the Son of God becomes united with those whom he is consecrating and leading to glory, united with us in our suffering, so united that he can call us brothers. This is what makes Jesus a fitting priest (and, we'll see, a fitting replacement for Judaism's priesthood). should make their leader in the work of salvation perfect through suffering. He who consecrates and those who are consecrated have one and the same Father. I'm not authorized to tell you to substitute this translation. But now at least you know what translators thought it should sound like not so long ago. And you can see that most occurrences of "he" in the reading refer to Jesus. The one "he" in "For it is fitting that he, ..." refers to the Father. Do you know how hard it is to find an artwork depicting Adam and Eve without the snake and the apple? Then find one where the website author accurately attributes the work. The cheeky webizen whose site provided this image says his source is the Russian website Pravda. A more credible site says this is a 12th- or 13th-century mosaic in the Cathedral of the Assumption, Monreale, Sicily. 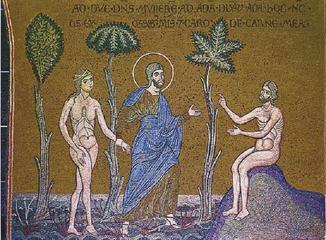 See also this other episode from Genesis, in Monreale. And this page has a smart critique of the mosaic and links to more about the Cathedral.